Yahuse Rave…who sabi craze? Wild`n`crazy, no dulling. 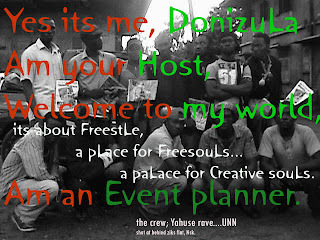 That was the caption of a crazy rave that was full of freestyle organize by DonizuLa. The stickers where seen everywhere in campus; at joints, hostels, hoods and lecture rooms, since the sticker was in black and white, it caused controversy with its caption `Yahuse Rave` coming soon. Everybody wanted to know what was coming soon…some thought it was fraternity stuff until the posters came out weeks later. Nobody knew what to expect even with the posters out. Papi Flo`o rocking Alicia keys in the poster; people still didn’t get the whole message because the poster was catchy and simple but still unexplainable; Papi flo’o, a celeb in campus rocking Alicia keys a star celeb in the states. So I guess everybody wanted to find out what this Yahuse Rave was all about. Olu Maintain`s yahoose played very loud while moving around Campus for logistics and since the song was just released and haven’t gotten to the East, let alone Nsukka, it helped our parol because they thought it was the official song for the Rave, many on Campus thought my crew did the song. For awareness we moved in convoy of open roof jeep, a Honda bullet and a hummer bus like yahoo boys spiced with our Dj scratching on the wheel of steel while our dancers perform yahoose dance to the admiration of the crowds especially the females at their hostels. A rave with two Djs playing at same time at the venue, Hotel Carolina; One was slamming inside the club, the other blast in the compound and the beats were heard far off in the hood. It was a carnival, Photographers and magazine crews were seen around. We made provision for two snooker boards to be brought into the hotel. We had a Love Garden for love birds and also a VIP section at an increased price. We had shrines, were rude boys and girls are seen going into and coming out with dimmer eyes. You could see many rude girls from `flats hostel` shaking their booty incessantly to different beats. It was a rave that had the highest number of attendance in an off campus event for the university. Lots of girls ready to dance…security was Maximum….Vigilantes, school security and the Armies were present…hmm, what a rave…at the end of it I gave a broad smile like say my maga just pay because I, Donizula and my crew (Papi Flo’o and Chuke) made it possible…what was possible? Kick starting our dream of hosting mega events.